Green Party leadership election: a stitch up? 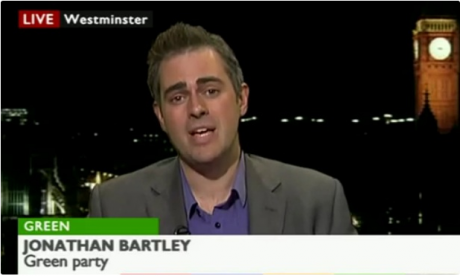 Is Caroline Lucas using her profile to give the relatively unknown Jonathan Bartley a shoe in to the Green Party leadership? When I joined the Green Party, about six years ago now, there was a slogan: ‘Fair is worth fighting for’. It struck me that fairness really was something people in the party cared about – not just in terms of party policy but also internally. Everything seemed to be up for grabs. If you wanted to be an election candidate or take on a leadership position you could go for it, and if you were good enough you had a chance. I’m sure that discrimination and abuse of privilege were always present, as in every part of society, but it felt like a party where many people held fairness as a core value and really believed in it. At that time, the party was also starting to shake the ‘unelectable’ image of the past and was getting organised. It felt like being on the cusp of something big and this made being involved really exciting. When Caroline Lucas became the party’s first MP there was a real buzz – who would be the second or third MP to get elected? Four years later and Lucas has announced she is running for leader again, but this year on a joint ticket with Jonathan Bartley. If elected they will be co-leaders. The two deputy leader roles will be reduced to one. Since it became clear that we were going to have an open leadership contest without an incumbent, there has been a lot of speculation, and actual excitement about who would run. This was the first bit of excitement and positivity I think the Green Party has had since Corbyn took charge of the Labour party and taken the limelight (and lots of Green Party members). Lucas and Bartley were the first to announce their campaign and did it in style – rather than going through the usual internal party channels they went straight for an article in the Guardian. But the announcement by Caroline about returning as leader, I believe, has meant that most who were considering running campaigns now won’t put their name forward. I am sure there will be some competition, but the general expectation is of a coronation rather than a real contest. Caroline is the Green Party’s only national household name politician. Unless something amazing happens, there is a risk the contest has already been killed off. There is plenty of speculation about why Caroline is really standing – beyond the generic reasons given on the campaign website. It’s possible that she shares the frustration with many party members that we are now merely treading water and the party is struggling to find its own identity now that Cobyn’s Labour party own what we considered our flagship social justice policies. I fear the Green Party could become a single issue environmental party again unless a strong leader can give a clear direction, and I suspect that fear is shared by many in the party. But does her standing signal that Caroline no longer feels that the party has a wealth of capability and experience needed to create this clear direction? If it was there four years ago, but not now, where has it gone? If this is why she is running, then I am worried it is indicative of a breakdown of trust between Caroline and the rest of the party. It sends a message that she has no faith in level of skills found within the party and feels she has to step in to save it. If she had waited just a couple of weeks before announcing, she may have found that there was a decent slate for the election. That may have made her feel that she didn’t need to balance two huge jobs of being our only MP and the party leader. Now we may never know what could have happened and who else may have come forward. The theory I like the least is that she was dishonest about why she stood down four years ago – that is was really about defending her marginal seat in Brighton which she now considers safe and therefore is free to return to being party leader. I really don’t believe this, but the speculation is out there. But what about her running mate Jonathan Bartley? He is relatively unknown within the Green Party outside London. By being on a joint ticket with Caroline, he could become a co-leader of the party without any mandate of his own. He could ride in to the role on her coattails instead of earning his place through an open and fair contest which would have enabled him to become better known, test how the party feels about him and build up his profile. If Bartley had run on his own he wouldn’t have had access to Caroline’s supporter base, her Twitter and Facebook accounts with hundreds of thousands of followers and the ability to get articles straight in to the Guardian. But with Caroline having chosen to gift him access to everything she has built up, because he is her preferred candidate, it feels a bit like the election has been broken, almost rigged. It may be within the rules, but that doesn’t mean it’s right. In the future if this trend continues, to be a leader or target candidate may no longer be based on your skills or ability to do the job – but on your party connections and fitting the mould of what people in influential parts of the party think a leader should look like. At some point our slogan was changed and is now ‘For the common good’. It’s easy to see how the Lucas-Bartley campaign can be justified. Two experienced media-savvy politicians, based in London and the South East, working together, for the good of the party – the end justifies the means. But does it really? Or maybe this kind of top-down decision-making by a party establishment just removes opportunities and ends fairness.